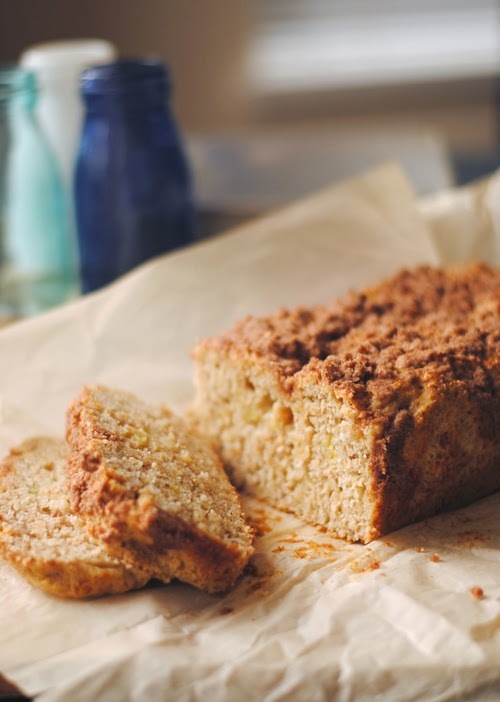 I haven't posted in what feels like forever, so please accept this delicious banana bread as a peace offering, okay? It's basically been what we're surviving off of because it's seriously addicting and the best damn banana bread I've had. My absence is partly due to the man and I just surviving the (I'm pretty sure official) World's Worst Cold. In all the years I've known this guy, I have never seen him that sick. To be honest, it was somewhat satisfying to see him swollen and snotty. No, I'm not a monster. I'm just usually the one whose immune system throws itself on germs like they're grenades about to take out my family. It was kind of nice to not be in it alone this time -- I had my own personal sniffle buddy! So, yeah, I totally promise to post more and stuff. Feel free to stop by next time with some milk because oh, there will be so many cookies. Preheat oven to 375F. Grease a standard loaf pan (about 9x5) and set aside. In a large bowl, combine the oil, brown sugar, egg, vanilla, and banana. Stir in the remaining ingredients until just combined. Pour into the greased loaf pan. Combine the ingredients for the crumb topping in a small bowl. Mash it all up with a fork or your fingers until it's pebbly. Sprinkle over the loaf evenly. Bake for 40-45mins, or until a skewer or knife or something inserted in the centre comes out clean.